We mentioned in our post about our #et4buddy pilot project at #et4online that we would be trying out a variety of technologies to support the pilot project. This week two technologies crossed my path: Meerkat (@Appmeerkat) and Periscope (@periscopeco). Both tools are available for free in the Apple App Store and allow you to live stream to the internet directly from your iPhone or iPad. I started off by experimenting with Meerkat. I was creeped out about it at first – mostly because it streamed live from my phone too easily. I hit a button and suddenly my camera was live streaming. I felt like I did not get enough warning before the camera went live. After streaming for less than 30 seconds I started to gather followers. I was surprised that they were totally random people, rather than the folks that follow me on Twitter. I didn’t leave it on long enough for my friends to find me. My next experiment was with Periscope. Having learned a little from my Meerkat experience, I went out for a walk before doing my experiment. I really didn’t like the idea of live streaming anything directly from my apartment. I liked that Periscope made it a lot clearer before the streaming started (I had to hit a button that says “Start Broadcast”). Prior to the first broadcast, I got to choose whether or not to enable video, audio, and location services. So, I can stream my video and audio without the need to share my location. I turned on a broadcast while I was walking, and within about 15 seconds I started to get a few followers. I asked the followers to post a note to me, and a couple of them did. I liked that I could see the notes on the screen easily. I could see the potential of using this as an easy way to broadcast an aspect of the conference while collecting feedback and questions directly from those following along. Unfortunately, within a minute I also picked up a troll, inviting me to “switch cameras so he could see my beautiful face”. This got me to turn off the public broadcast pretty quickly. I then tried a private broadcast with Maha (@bali_maha). That worked much better – however, I was talking and filming while walking, which made the video rather jumpy (and I was showing the river which came across as nondescript random nature). I learned that for #et4online, I’ll need to move a lot slower and allow my audience some time to “see” what is on the screen before I move around. I shouldn’t assume that those viewing the video can make sense of it as quickly as I do with the full live view. With both of these apps, I’m worried about accidental streaming. 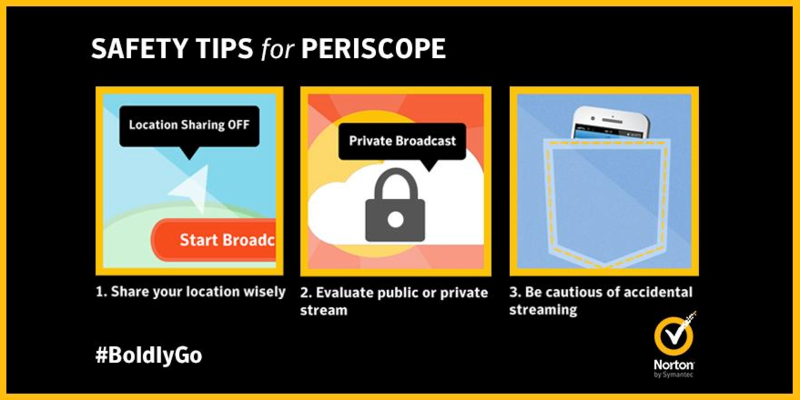 I’m a little less worried with Periscope, as I seem to need to go through more steps before starting the broadcast. Given my limited experience and how quickly I picked up a troll, I think that I would recommend to all women to turn off location services by default – only use it if you really want to broadcast your location. For #et4buddy we may need to limit the live stream to a select audience as a private stream, just to avoid the unneeded commentary of trolls. Agree on privacy. I also don’t feel comfortable live-streaming sthg with actual ppl in it as they might accidentally show up on screen without their permission. I would maybe imagine u using it for exhibits as u suggest and for filming specific ppl who agree to be filmed for short periods. Might also work for some of the sessions where i will be co-presenting (private stream from the room to just me?). What do u think? The ways these services can be abused is just…gigantic in my mind. Trying to get my head around it.